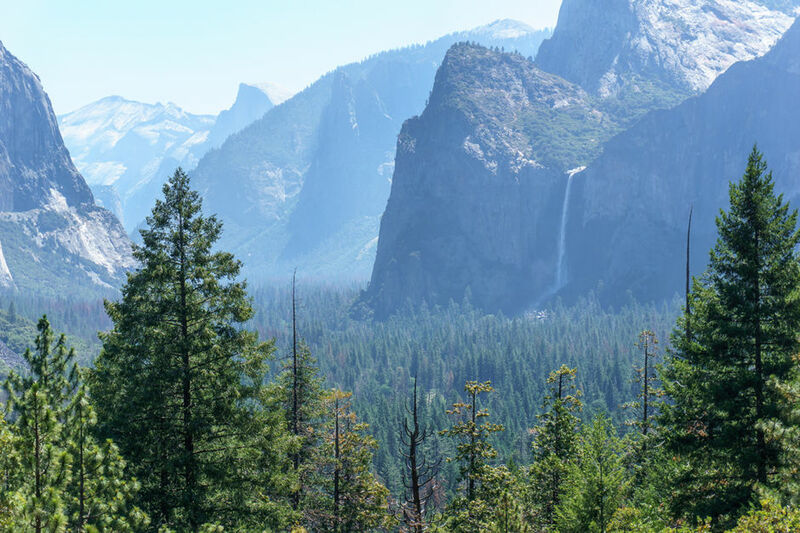 Although it would take years to see all the wonders residing within Yosemite National Park, my adventure buddy, Ryan, and I had only 24 hours to take in as much hiking, sightseeing, eating, stargazing, and wildlife-watching as possible. Determined to pack our day with some of the park’s best — and leaving enough time to really soak everything in — we half-planned, half-winged through one of America’s favorite National Parks. 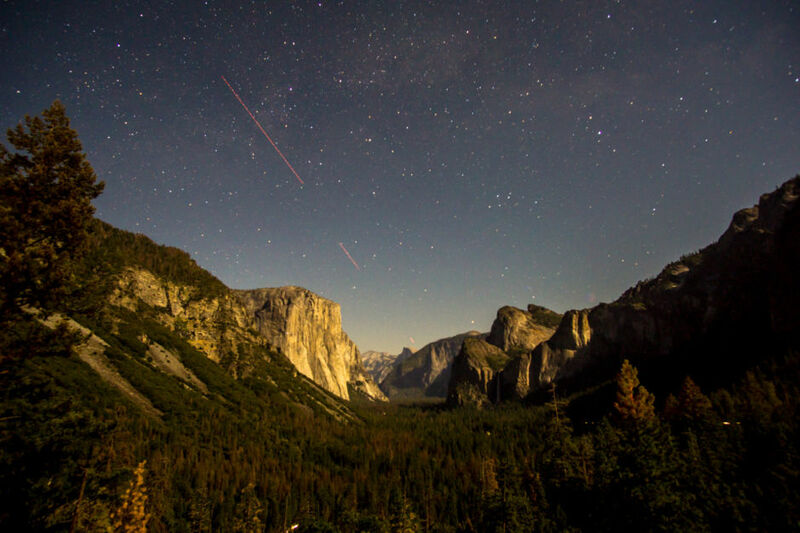 Here’s a guide on how you can experience some of Yosemite in just 24 hours. 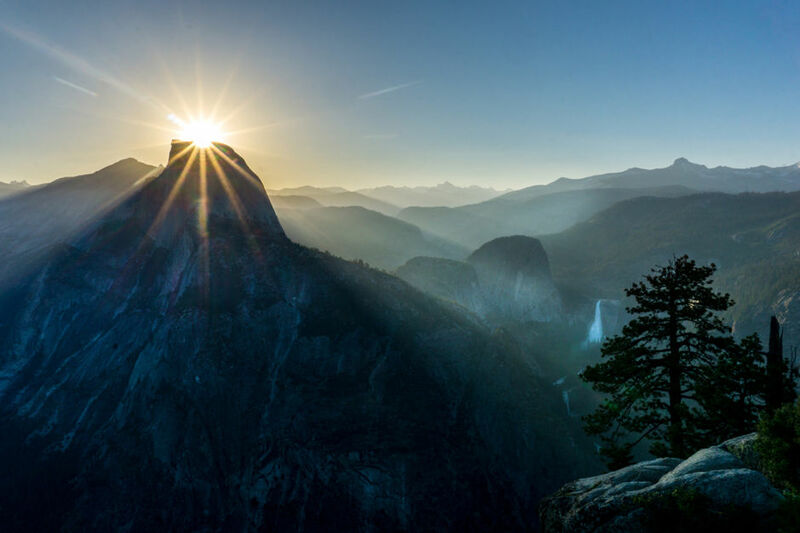 At 3,214 feet above the floor of Half Dome Village, Glacier Point is perfect for admiring the first light of the day as it illuminates the valley below. 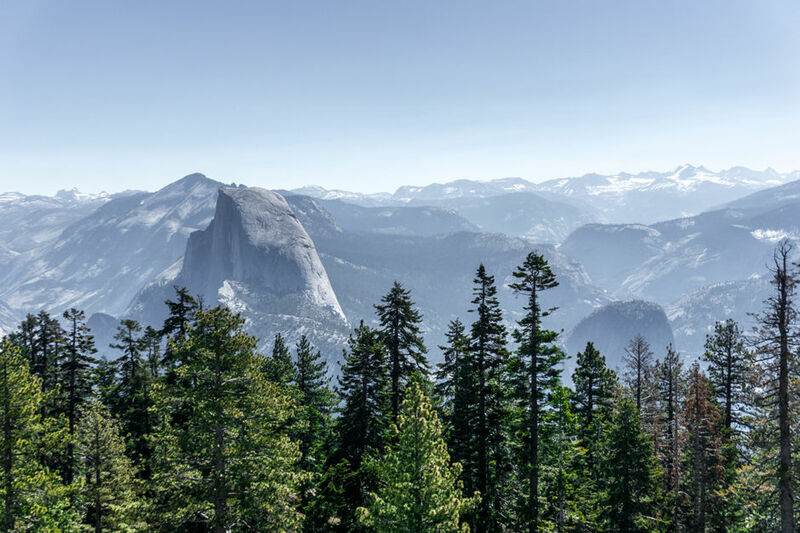 Half Dome, Yosemite Falls, Yosemite Valley, and Yosemite’s high country are all within view from Glacier Point, and it’s not hard to see why this is one of the most popular overlooks in Yosemite. 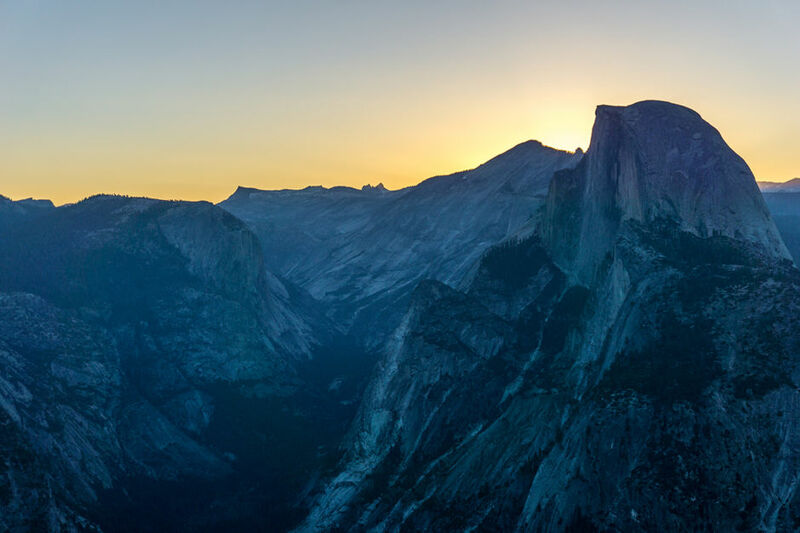 The 2.2-mile hike to Sentinel Dome is a gorgeous way to start your day. This is a fairly easy hike with an uphill push at the end to the dome’s crest that will take hikers to a 360-degree view of the park. It’s also a perfect place to munch on breakfast. Note: Make sure you pack out any trash and don’t feed the wildlife! 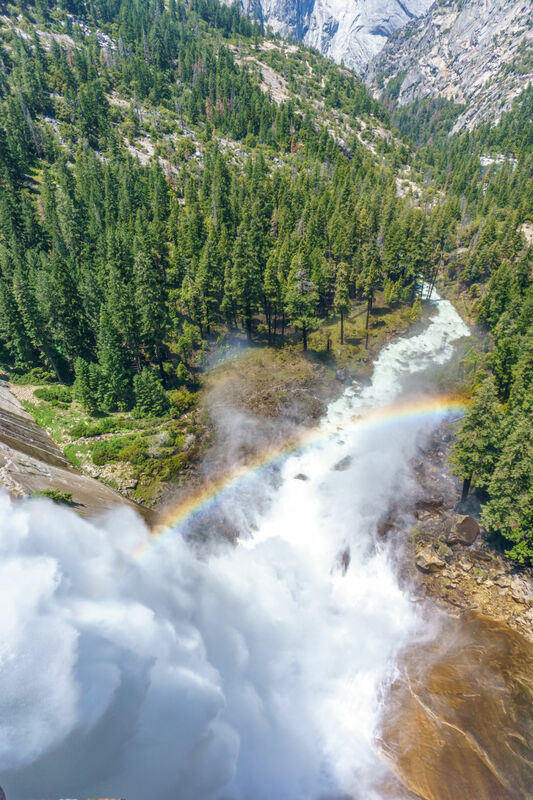 A bus ride takes us to the Vernal Fall and Nevada Fall Trails. Although some could be deterred because of the trail's moderate to strenuous nature, the views at the end are worth the price. Three different main overlooks reside along the trail, giving visitors the opportunity to choose their own distance. After 400 feet of altitude gain and only .8 miles into the hike (1.6 miles round trip), a sturdy footbridge extends across the river, filled with photographers snapping shots of the distant Vernal Falls. 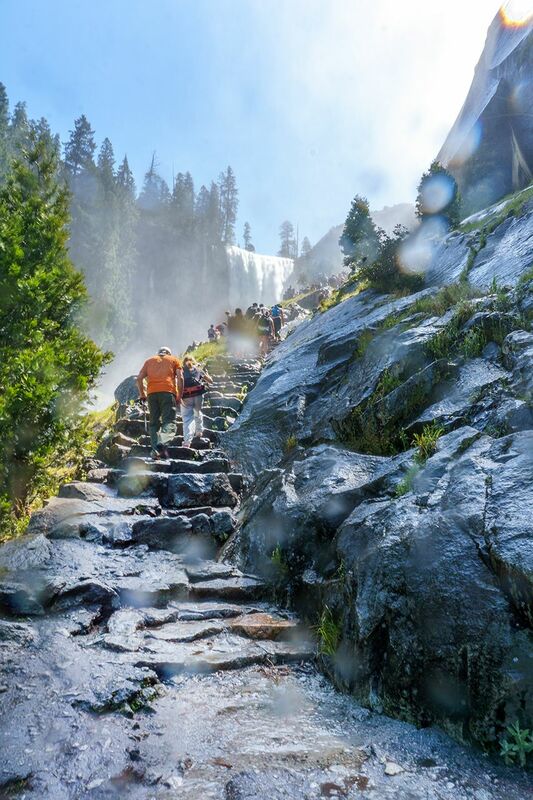 1.2 miles into the path, you’ll find the wet, rocky steps to the top of Vernal Falls. The falls’ mist is enough to drench you, and it is advised to wear appropriate footwear and clothing. You’ll also want to put your electronics in a safe, dry place. The trail runs along the Merced River, and you should be careful not to get too close to its icy waters. 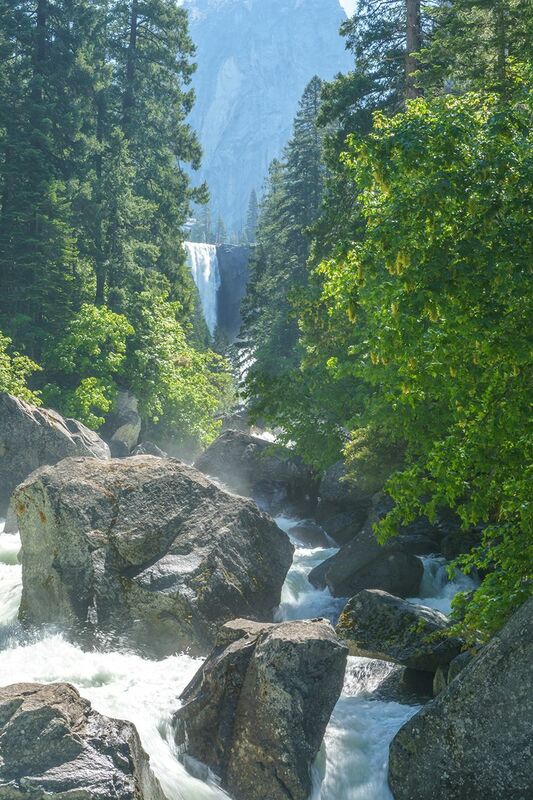 After a steep 2.7-mile hike to the top, we are rewarded with this awe-inspiring view of the Nevada Falls. Down below, the river disappears into the vibrant pine forest surrounding the valley. We only stop briefly at Tunnel View, one of the better-known spots in Yosemite. From here, you’ll be able to see El Capitan, Bridalveil Fall, and Half Dome in the distance. The valley disappears into a mid-day haze and we mark the filled parking lot as a place we want to return to for stargazing. A long day of hiking leads us back to the valley, but Ryan looks at the map and we decide we have one more hike in us. As dusk approaches, we find ourselves on the short 1-mile, round-trip trail to Lower Yosemite Falls. 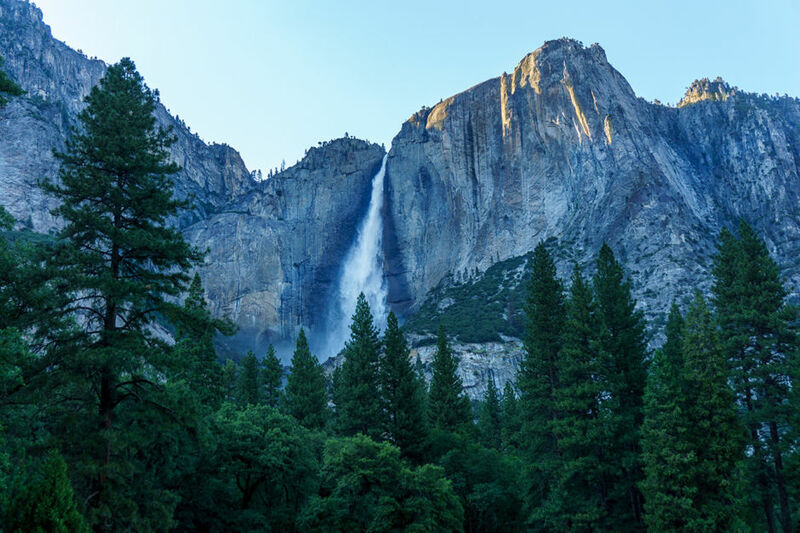 From further back, you can only catch a glimpse of the upper falls, but the trail will pull you into the forest and right in front of the falls’ full force. Following a dinner of camping-style, stove-cooked spaghetti and sun-warmed garlic bread, we ask a park ranger for one of the best spots to catch the sunset. “Sentinel Bridge, you’ll know it when you see it”, she replies as she points to a small dot on our map. After landing ourselves in the middle of the bridge, we understand the reason behind the tripod overpopulation all around us. 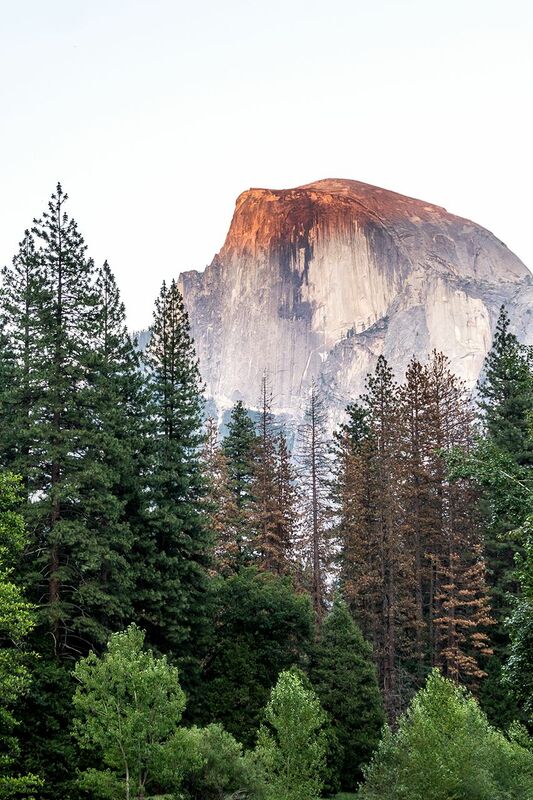 This is the view of the Half Dome you want to take back home. Remembering our earlier experience at Tunnel View, we know we want to find ourselves below the stars in such a magical place. After an incredible sunset lower in the valley, we pull up to an almost empty parking lot. As the last light of day disappears from the sky, and families go back home for the evening, one by one, the stars begin to appear. The towering faces in the distance are illuminated by a crescent moon as we lounge with legs swinging off of a stone bridge. Time to breathe in Yosemite. A dark, winding road carries us to where our day in Yosemite started. And here, we’re treated once again to a sweeping view of the valley, but this time there’s a sparkling sky above us. 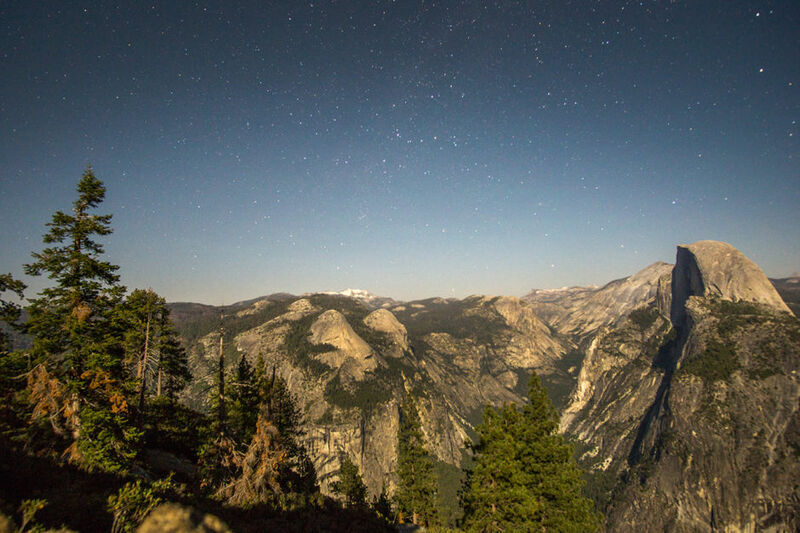 After a chilly evening of stargazing and little sleep, we camp near Glacier Point. I set a 4 AM alarm to make it to the overlook in time for the sunrise and to take one last look at Yosemite. The perfect end to a very full 24 hours!